In County Durham during August and September 1993, there were several reports of a large puma like feline stalking the fields. With breathtaking originality, the press dubbed this particular creature the Durham Puma, echoing its Surrey predecessor of some 30 years before. The real high spot of the Durham sightings came in September of 1993, when several national newspapers printed a colour photograph of a large, reddish brown cat, approximately the size of a medium sized dog, carrying a dead rabbit in its jaws. On Sunday l6 th August 1992, Durham based photographer Phillip Nixon was driving down a country lane accompanied by his son when, near St Johns Chapel, Co Durham, they were surprised to see the cat standing in the road ahead of them with a rabbit in its mouth. Nixon estimated the cat to be about the size of a border collie. He stated that it had reddish brown fur, with a stripe near each eye and a very long tail which curved upwards when it moved. When the cat carried the rabbit in its jaws, the rabbit flopped around, which prompted Nixon to assume that it had been killed recently by the cat. Some of the nationals put forward the view that the rabbit had rigor mortis and had been scavenged by the cat. The animal jumped over a four feet high stone wall and ran across a field. Nixon jumped out of his car, grabbing one of his long lens cameras and took the photograph as the camera rested on the wall. Nobody, least of all Nixon, has satisfactorily explained why it took so long for the photograph to surface, although it is possible that, like most people, Nixon knew little about the ABC phenomena until it gained national media attention. I have just been looking at the "Durham Puma" photograph and I agree that it is not a Puma, nor would it be a Lynx, given the tail (unless it is a plastic bag - which, given normal cat behaviour is unlikely, i.e. the cat would, even in escape, try to remove it). Given an estimate of the size (using the photograph) there are a few options. The Head and Body (HB) size estimate is around 850 mm, the total length is about 1350 mm (Tail of around 500 mm) and a height at the shoulder of around 368 mm. These are very rough figures and can be calculated, using the rabbit , in that an average adult rabbit total length of 460 mm (I used Boitani, L. & S. Bartoli, 1982 . The MacDonald encyclopedia of Mammals. MacDonald & Co., London. as it was the only book at hand on British mammals at the time - sorry). The estimate is just bigger than the range for Wild Cats (using Tomkies, M., 1991. Wildcats. Whittet Books. This also lists the biggest ever properly recorded tom wildcat as being only 1170 mm) and the proportions are slightly wrong (the head and body to tail ratio), however it could be an extra-limital Wildcat. This would also tie in with the range of domestic cats. The second option could be something exotic. 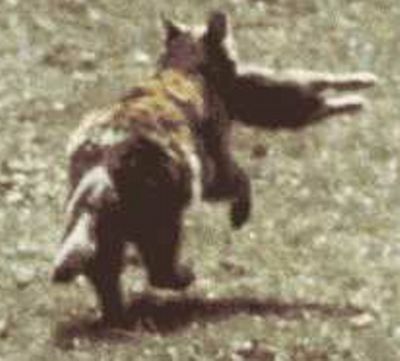 Given that the tail is not actually a plastic bag or some other accidental attachment, it is far to long for a Lynx, although not for a caracal. I think that Caracals are unlikely, although I have heard that Caracals living at high altitudes have no ear tufts and "woolier" coats but I can't find any references for this. It is too small for a Puma (except, perhaps, for a very small female), although the HB to Tail ratio would be right (if the estimates are right) - (using Eisenburg, J.F., 1989. Mammals of the Neotropics. The Northern Neotropics. Vol. 1. University of Chicago Press). There are a whole host of other cats, such as the African Golden Cat, the Asiatic Jungle Cat and the Asiatic Golden Cat that it could be. It has to be said that it is too big, even if you take conservative estimates, for a fox, not in length but in height and tail to HB ratio. Also, it does not look like a fox or dog. The lack of visible claws and musculature strongly suggests cat, as does the behavioural use of the ears. The rabbit is adult (the back legs are complete and show no juvenile fat bulges). I hope that this can help identify the cat. I must admit I am bit stumped by it (that is unless it is one of my suggestions). If anyone can do an analysis of the photo, I am sure that it would help pin down the cat. Thanks for the information - fantastic stuff. I don't know enough about the exotics you mentioned to comment, but the only caracal I have seen was much more slender than this appeared - was the cat I saw a-typical? Also, given the perspective, how accurate are your HB measurements and what % of error is feasible. Certainly looks larger than a fox. It's definitely a mystery animal! I don't think that the caracal you saw was a-typical. The reports of the Highland populations of caracals that I mentioned indicate that, in colder climatic situations, caracals (like most carnivores) have a seasonal rougher coat. This could explain the bulkiness of the animal seen. However, I would agree that this is unlikely to be a caracal (even if it is a member of a regional subspecies). The other three cats are the African Jungle or Golden Cat (Profelis aurata, which has spots like those just visible in the photograph), the Asian Golden Cat (Catopuma temmincki, which does have a spotty form, although the spots are very different from those showing in the photograph) and the Asian Jungle or Swamp Cat (Felis chaus). There are quite a few cat species that fit this mid-size range, but most are either Lynx like or very differently coloured. These are also the nearest I can come up with that may match the HB to tail ratio. I have to admit that several assumptions were made in my estimate, hence all of the get out clauses. The rabbit is, as I explained, almost certainly an adult. I used (what I am hoping is) an average measurement from Boitani and Bartoli, sadly I cannot be sure of this at the moment as my copy of the Handbook of British Mammals is on loan. I used the perspective to work out the measurement from 3d. So, to go along with th rabbit, I had to assume that there was no distortion from the camera lense and that I had got the perspective right. My values are probably conservative (as I have tried to take the most acceptable range - i.e. the smallest). This means that, even if the rabbit is smaller, the cat is still substantial. As to error values, I am not sure what figure I could place on them, given the assumptions and assumptions made on the validity of the photograph itself (i.e. has it been doctored - was it taken in the UK at all?). I would put a 20% error on the figures at the moment (not statistically calculated but of the top of my head). This would still keep the cat in this mid range envelope either way. One correction to my estimate can be made, that is the HB and tail measurements for the rabbit. The Handbook of British Mammals (Corbet, G.B. & S. Harris, 1991. The Handbook of British Mammals. 3rd Edition. Blackwell Science, Oxford.) gives 400 mm as a maximum, so if we drop back from that (using a correction of 10% - i.e. a normal adult range) then the measurements for the cat would come to: HB 775 mm, Tail 450 mm, TL (total length) 1225 mm. This is still just above the very top range of either domestic or wild cats, possibly a super-normal individual. The Handbook gives the range of HB as 485 - 632 mm and tail as 242 - 315 mm, TL as 727 - 947 mm. This would mean that the cat is still 23% larger (using TL)! My first thought when I saw this photo some years ago was it looked like a Belgian Shepherd dog. (the red type Tervuran?) but if it is it's a big rabbit. On the other hand it's legs look a bit thick for a fox and the ears are set backward almost like a dog "Retrieving".Could be a fox in malt? or maybe a bit mangy. Also it's carrying the prey up high. 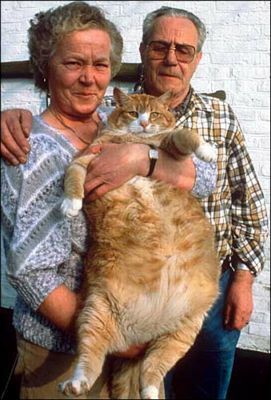 Concerning the size of domestic cats, the follow report from the PDSA suggests that many domestic cats and dogs are overweight, largely as a result of overfeeding. More than half of all cats and dogs in Britain are overweight, according to the veterinary charity PDSA. Vets working for the charity say many owners over-feed their animal or give them sugary treats. This can lead to weight-related problems such as difficulties breathing and exercising, joint and heart problems, and sugar diabetes. PDSA, which runs a network of 45 PetAid hospitals across Britain, today launched a PetCheck Programme to encourage owners to be more aware of their animal's state of health. Vets working at PetAid hospitals say half of the cats and dogs they treat could be classed as overweight. Four out of five dogs over six years of age suffer from gum disease, they say, which can lead to serious heart and kidney problems through the build-up of plaque and bacteria. Marilyn Rydstrom, PDSA director general said: "PDSA was founded in 1917 and our mission statement has always been to promote responsible pet care. "In light of these worrying new statistics, we want to give a higher profile to this aspect of our work, as we believe this will help to reduce the number of avoidable conditions that we see every day. "This will enable our veterinary surgeons and nurses to concentrate on caring for gravely ill animals when illness or injury strikes." To be eligible for PDSA treatment, a pet owner must live close to a PetAid hospital and be in receipt of benefits. Ths pic looks like a dog holding a rabbit. Not a cat. My name is Dennis and I am from Ohio U.S.A. I found your site via Google and was greatly intrigued when I saw the picture of this "Durham Puma". I was interested because I saw an animal much like it outside my home here in Burton. It had been carrying an animal, which I assumed to be a rabbit in its mouth. What I recognized most from the picture was the bulkiness of the fur and the color. I couldn�t see the face of the cat but the bodies match. - this is a Jungle cat, not a mangey fox as I have heard on numerous occasions and not a cat with a bag over its tail. The Durham 'puma' is in fact a Jungle Cat - not as some people have said a mangy fox. The tail is slightly shorter in relation to the body length than many cats - which is what confused some people who perhaps were expecting a longer tail. It has a bulky squarish body similar in size to a Jack Russel terrier and legs about 12 inches long.